In order to obtain full efficiency and reliability, correct maintenance procedures are essential. 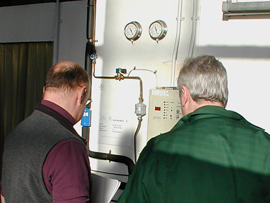 The Maintenance course is aimed at all maintenance staff, to provide them with an insight into the principles of refrigeration, the correct operation of the system to optimise running costs and the safety environmental issues currently at the forefront of the industry. This course can be run on site if preferred, training technicians on the equipment they will be maintaining. To attain a basic understanding of the principles of refrigeration and diagnosis of common faults. The topics will be covered with a strong emphasis on practical observation by the candidate using fully operational systems. Theoretical work will be assisted by the use of good quality visual aids and discussion sessions.